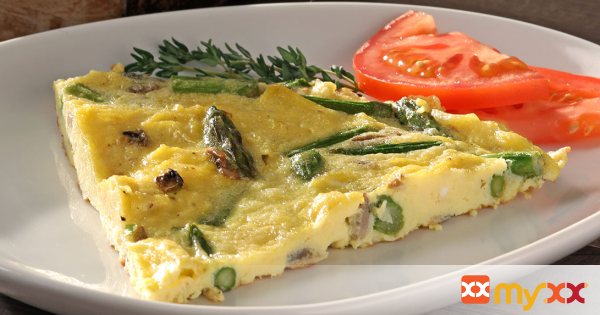 Make this Frittata even better by swapping out for HT Organics Products! 1. Preheat oven to broil. In medium size bowl, using a fork, blend eggs, HT Organics Shredded Cheddar Cheese, pepper, and salt. 2. In 12-inch non-stick, oven safe pan, melt butter over medium high heat and sauté asparagus and mushrooms for 2-3 minutes. 3. Pour egg mixture into pan and stir with rubber spatula. Cook for 4-5 minutes or until the egg mixture has set on the bottom and begins to set on top. 4. Place pan into oven and broil 3-4 minutes, until lightly browned and fluffy. 5. Remove from pan and cut into 6 servings, serve immediately and enjoy!